"Baltra" redirects here. For the name, see Baltra (surname). 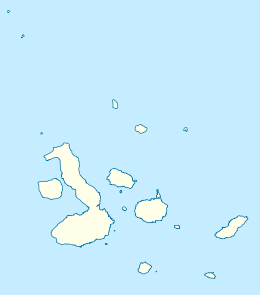 Baltra Island, or Isla Baltra, is a small island of the Galápagos Islands. Also known as South Seymour (named after Lord Hugh Seymour), Baltra is a small flat island located near the center of the Galápagos. It was created by geological uplift. The island is very arid and vegetation consists of salt bushes, prickly pear cactus and palo santo trees. The ultimate origin of the name "Baltra" for the island is unknown. "Baltra" is a Spanish surname (particularly Chilean), so it is presumably named after a person. The name is first found in print in the 1927 edition of the South America Pilot by the British Admiralty; it was added after the 1915 edition, but the document explaining the source has been lost. The name is sometimes incorrectly believed to be an acronym used by the US military, though the term predates the US base. During World War II, Baltra was established as a United States Army Air Force base. Crews stationed at Baltra patrolled the eastern Pacific for enemy submarines and provided protection for the Panama Canal. After the war the facilities were given to the government of Ecuador. Today the island continues as an official Ecuadorian military base. The foundations of buildings and other remains of the US base including the old airfield can still be seen on the island. Until 1986, Seymour Airport was the only airport serving the Galápagos. Now, there are two airports that receive flights from the continent, the other being San Cristóbal Airport on San Cristóbal Island. Private planes flying to the islands must fly to Baltra as it is the only airport with overnight facilities for planes. On arriving at Baltra, all visitors are transported by bus to one of two docks. The first dock is located in a small bay where the boats cruising the Galápagos await passengers. The second is a ferry dock, which connects Baltra to the island of Santa Cruz via the Itabaca Channel. Constructions for a larger, modernized airport began in 2011, and as of early 2013 it has started operation and the old buildings are being dismantled. The new airport is being run under a 15-year concession by ECOGAL, a subsidiary of the Argentinian group Corporación América and has been promoted as "the first ecological airport worldwide" due to its reduced energy consumption for lighting and ventilation, rainwater recovery, waste recycling etc. Baltra is currently not within the boundaries of the Galápagos National Park. The Galápagos Land Iguana is the subject of an active re-introduction campaign on the island; it became extinct on Baltra in 1954. 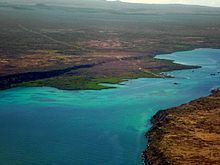 However, in the early 1930s, Captain G. Allan Hancock had translocated a population of Galápagos Land Iguanas from Baltra to North Seymour Island, a smaller island just a few hundred metres north of Baltra. The iguanas survived and became the breeding stock for the successful Charles Darwin Research Station captive breeding program. During the 1980s, iguanas from North Seymour were brought to the Darwin Research Station as part of this project and, in the 1990s, land iguanas were reintroduced to Baltra. As of 1997, scientists counted 97 iguanas living on Baltra, 13 of which were born on the islands. Currently, it is not uncommon to see iguanas either crossing the mainroad or on the runway at the airport. Bahia Baquedano, on the north coast of Indefatigable island, westward of Isla Baltra, the southern and larger of the Seymour islands, affords good anchorage abreast of a sandy beach and close southward of Birs cove on the latter island. Canal Ilabaca [sic, Itabaca], separating Indefatigable island from Isla Baltra, is available for boats. The previous (1915) edition does not show the above information. The Admiralty Hydrographic Department copy does however bear this handwritten notation: “Names. __ Baltra I. & Puerto Nuñez H 214/15.” This is an indication that these names are to be added to the next edition, and H 214/15 indicates a document containing source information. Unfortunately, the document cannot be located, and is presumed to be lost. And so therefore, is the origin of this name. ^ "Aeropuerto Ecológico Galápagos: About us". ECOGAL. Retrieved May 21, 2013. ^ "Aeropuerto Ecológico Galápagos: Sustainable building". ECOGAL. Retrieved May 21, 2013. Wikimedia Commons has media related to Baltra.